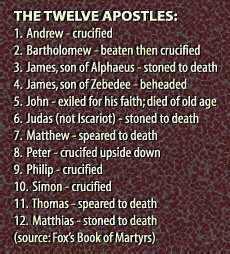 What do they mean, Christians were persecuted? What happened to the Apoptles? Today’s American Conservative Christians like to claim that they are being persecuted. They rasise this “cry” whenever anyone disagrees with them, when they don’t get their way or receive “preferred” treatment, or when they are mocked. Perhaps these folks need to remember what real persecution looks like?